It can be difficult to decide which window treatment is just right for your bay window. When it comes to bay window curtains, there are many fabric and decorating options to choose from. To help you decide which window treatment is right for your bay window, you should first decide what you want to use your bay window for. Is it a Decorative Area? If your bay window is mainly decorative, a hanging curtain is a great option for. The curtain will be able to close in front of the display, allowing you to have privacy whenever you like while also allowing your display to be seen from the outside. Perhaps you use the window as a nice place to sit and read. If so, panel curtains would suit you best. The panels can be lowered to any length you like. They are also easy to adjust to suit your needs, making them the perfect option for a lounge area. If you are going to use your bay window for storage, consider fitted hanging curtains that wrap around your bay windows. This will give your bay windows a comfortable feeling while making it easy for you to open and close the storage area when needed. Do you want a Cozy Look? To get a cozy look for your room, use a combination of both hanging curtains and panel curtains. 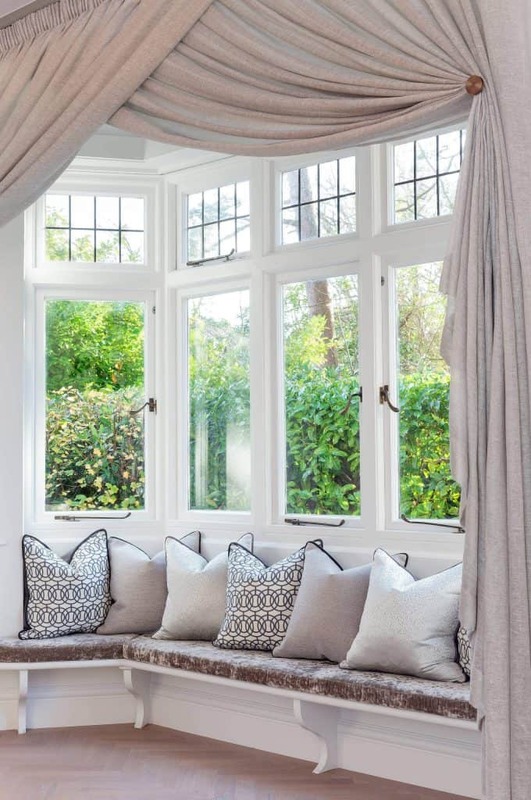 The hanging curtains go on either side of the bay window as decoration and the panel curtains cover each individual window for privacy and to block sunlight. This combination allows you to have fun with colors and designs. To give your bay window a bold look, use a decorative print for the hanging curtains and a solid color for the panel curtains. Reverse this idea to give a fun and creative vibe to the room. Another way to achieve this look is to mix and match the materials of the curtains. Using bamboo panel curtains and canvas hanging curtains gives a room a wild look and a laid-back vibe. 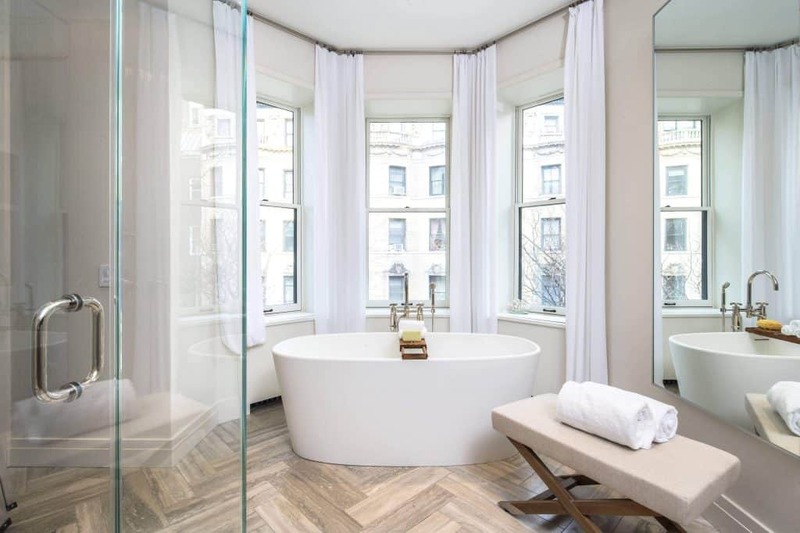 If you aim to impress and you want an unobstructed view of the ocean or to a panoramic view of the city, choose bay window curtains or treatments that frame your windows. There are many bay window treatments that provide this look, such as large drapes, window valances or floor to ceiling curtain panels. Drapery panels are placed along the return walls of the window, extending from the ceiling to the floor in long flowing lengths. These should be able to close efficiently when needed. 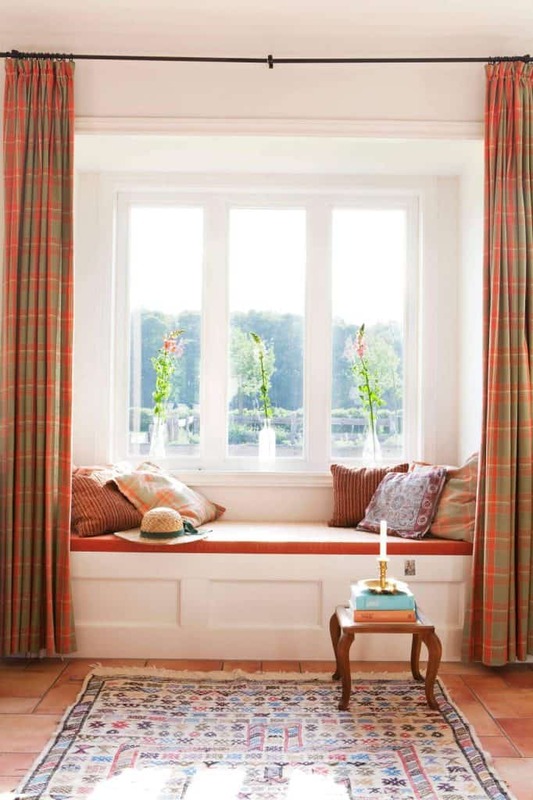 These curtains should frame the bay windows and allow you an unobstructed view. Soft silk panels are great for shading bay windows. 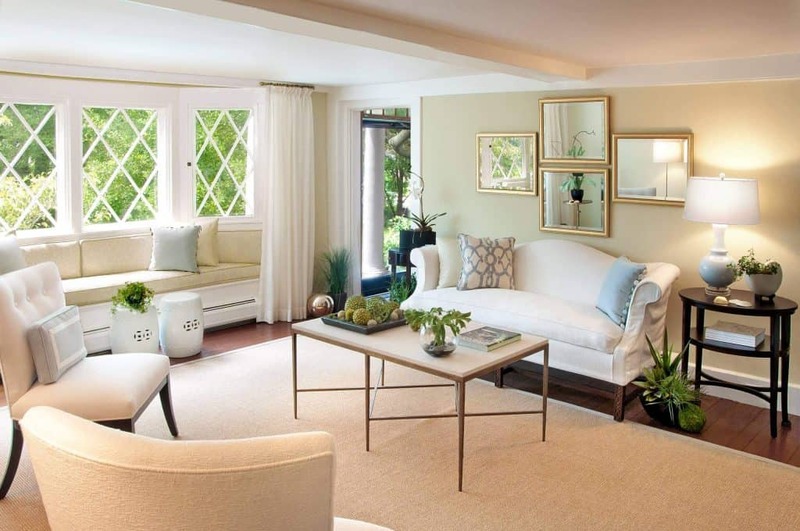 These popular bay window curtains update the appearance of any height or width of bay window. Make your windows more dramatic and contemporary looking by using fabric tape or a braid to gather the curtains halfway down. 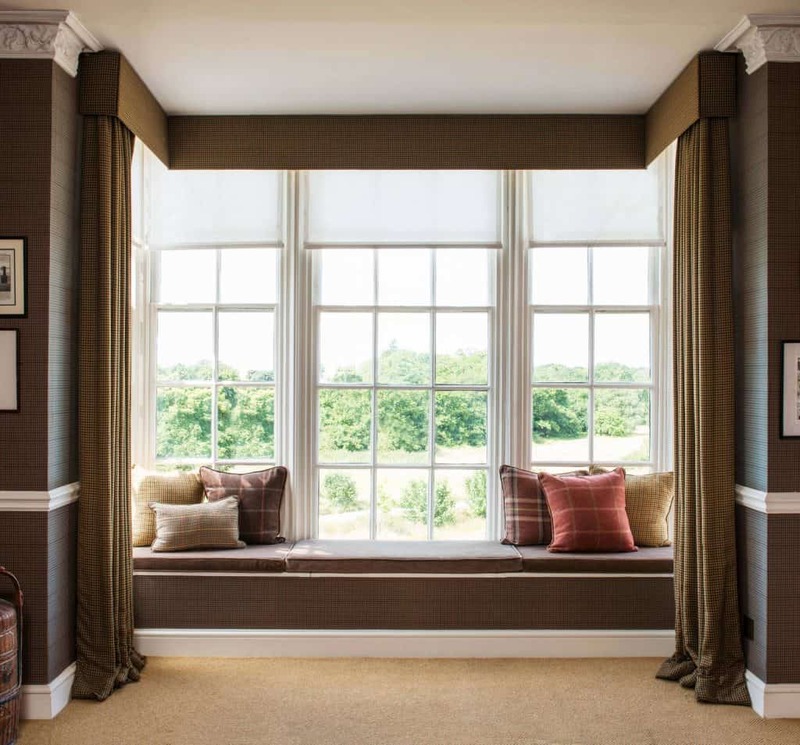 Your bay windows will have a classic style and provide a view of the scenery outside without revealing the inside. A formal valance is easy to do and provides a beautiful upper frame for bay windows. This goes well with tall or short bay windows and would be perfect for windows with shutters. Tie the room together by choosing color-coordinated fabrics for your curtains, pillowcases, rugs, and bedding if you are dressing up your bay window. Flat roman shades frame the window and at the same time provide privacy. These shades are also easy to install and easy to clean. You can also find roman shades in many different colors, textures, and lengths, which will fit any size or length of bay window in any room of the house. You can match your bay window curtain colors with the rest of the fabric in the room to create a unified effect. One method is to match pillowcase and rug colors with your bay window curtains or match your curtains with the wall color. Remember that curtains or window treatments this large can make a huge impact in your room and therefore should complement other items inside the room as well. How Can They Be Cleaned? When you choose bay window treatments such as curtains, think about how easy or difficult they are to clean. Curtains made of cotton or polyester can go in the washing machine and are easy to clean. Shades such as roman shades are a little harder to clean, but you can simply use a vacuum cleaner to remove dust and have them professionally cleaned once a month. After you choose your bay window curtains, decide if you want to buy an adjustable rod or if you want to have a rod made specifically for your bay window. While purchasing a bay window curtain rod that is specifically made for your bay window may be more expensive, it will have an elegant and clean look and will be much sturdier than an adjustable curtain rod. Both adjustable and custom-made curtain rods are made out of all sorts of materials. Wood creates a warm and homey feeling, while chrome and steel work well with a modern and contemporary look. Also consider the ends of the bay window curtain rods, as these are a great way to add a hint of style and flair to your room. You can find hundreds of decorative metal ends that fit any décor and any household. How Do You Buy Curtains for Bay Windows? Sadly, there are no easy solutions to solving bay window treatment needs. 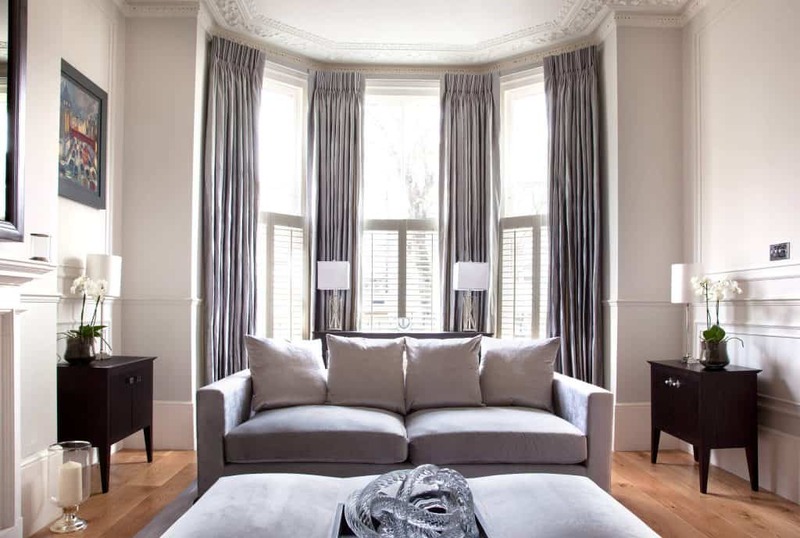 For a perfect fit, you will need the services of an expert tailor to design and sew curtains, drapes or shades for you. 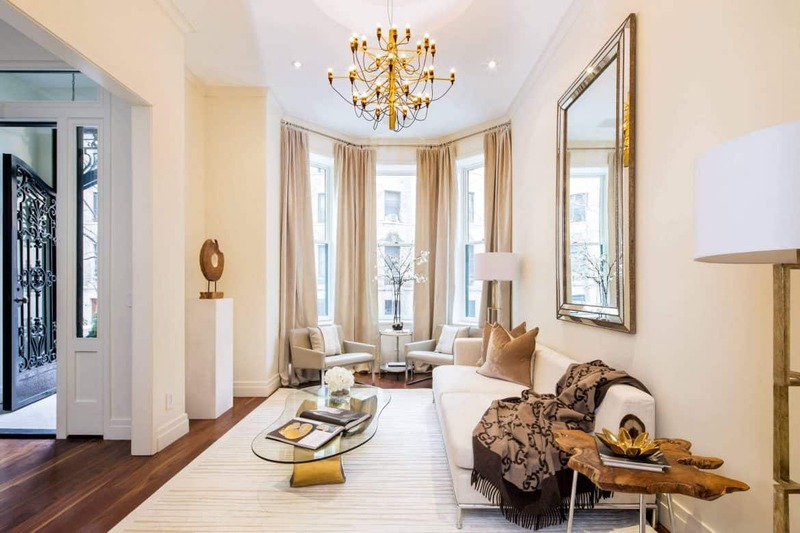 Bay windows differ in size, shape, and depth. Only an expert tailor will be able to create the most suitable window treatment solution that will maximize the size and the length of the bay windows that you have. A tailor will usually come to your home and take some measurements. They will also consult with you if you have any particular curtain designs in mind. A tailor will help you find the ideal material to use for your windows, and this material should fit the other fabric inside the room. It should also be easy to care for and clean. A tailor will also help tie the room together by using fabrics of complimenting colors, shapes, and designs. If you can’t afford to hire a tailor, there are other options. There are many premade curtains and shades available, but you may find that none of these options are an exact fit for the size and shape of your window, especially if the window was custom made. For example, you may not be able to buy drapes that hang perfectly between the curtain rod and the floor; there might be a gap, or they could be too long. It is very important to get the exact measurements of your windows before you shop for premade curtains and shades so that you can ensure the closest fit possible. With all the options for bay window curtains and shades out there, you can get the perfect choice for your windows with just a little research. Take all these tips into consideration when picking out your curtains and you’ll be sure to find something that suits your windows and home. Until now we went for the no-curtains look and it worked well, I love all the light. Recently someone moved in the house across the street that’s been on the market for years so curtains it is I need my privacy, right? I was thinking of going for something grey or off-white – the walls are white – but I can’t seem to find the right fabric for this, they’re too sheer.